Iconic Miami Dolphins logo screen printed in full colour. 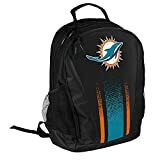 Carry books, homework, lunch, sports kit, tablet or other everyday essentials whilst showing your support for your favourite NFL American football team, the Miami Dolphins. This lightweight and comfortable backpack made of durable 600D polyester measures approximately H-48cms x W-32cms x D-15cms and has the iconic Miami Dolphins logo screen printed on the back in full colour. The outside of the rucksack has mesh pockets on either side suitable for water bottles, secure zipper closures with pull fabric on zippers, the back is padded for comfort and has two adjustable padded back straps, and a loop handle on top to hang the rucksack in a locker for example. The rucksack has a zippered front pocket with zippered inner pocket to keep smaller items neatly organized and quickly accessible such as tickets, pens a cell phone or wallet and keys can be attached to the interior keyring. The zippered main compartment inside the rucksack provides ample and flexible storage space for a laptop. The top has an exit hole for your headphones lead. The rucksack is easy to maintain, simply wipe clean with a damp cloth. Officially licensed NFL product. This entry was posted in Sports Kits and tagged Backpack, Dolphins, Miami by All Kits. Bookmark the permalink.